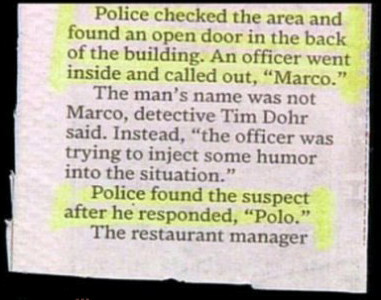 If everyone was this dumb, the world would be a safer place. 1. This dynamic duo, who called the police by accident while discussing their thievery. 2. This would-be police evader. 3. This crim who didn't see the glass coming. 4. This guy, who just won't give up despite ALWAYS getting caught. 5. Or this shop thief who similarly didn't expect the chair treatment. 6. This guy who didn't even make it to car. Undercover officers at Derbyshire police sent letters to dozens of people who had evaded arrest asking them to ring a marketing company to collect a free crate of beer. A total of 19 suspects fell for the hoax and called the number on the letter, which put them through to police officers based at Chesterfield Police Station.They were told that they needed to arrange a date and time for the free alcohol to be dropped off at an agreed address. But instead of being handed free ale the wanted men found themselves confronted by police, handcuffed and under arrest. 10. These expert driver criminals. 11. This chap who is having a bit of trouble with his criminal ski mask. 12. This man who tried to evade justice by eating the evidence. A bungling burglar was caught red-handed trying to loot a house when police were already inside interviewing a victim of another crime.Darren Kimpton, whose counsel described his offending as 'clumsy' and 'pathetic', had planned to steal items and sell them to buy Christmas gifts for his elderly parents. 14. This shifty fern stealer. 15. The man on the right who was apprehended wearing the most menacing criminal outfit imaginable. 16. This hardened crook who was scared off by a singing fish. 17. This phone thief who realised that those little wires were there for a reason. 18. This woman who confessed to her crimes on YouTube. 19. 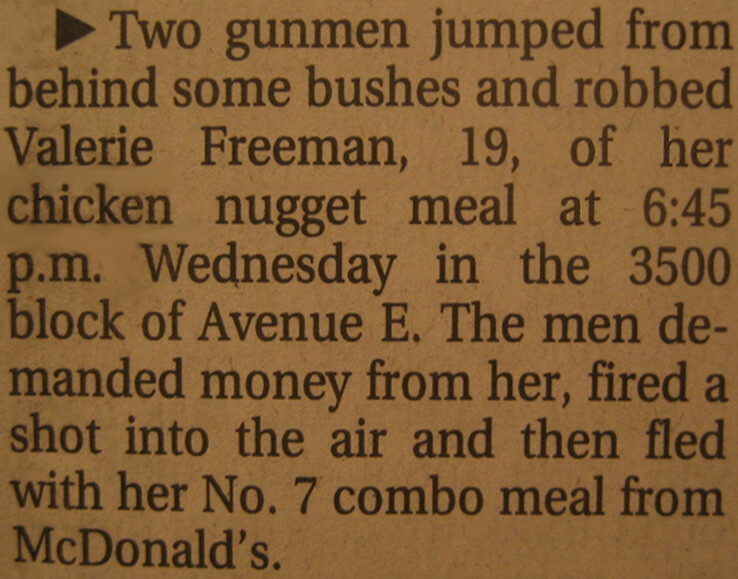 These McDonald's-loving fugitives from the law. 20. This betting shop robber who didn't expect to be beaten up with a chair. 21. Whoever attempted to hold up a bank with a toilet plunger. 22. This burglar who picked the wrong shed to steal from (because it was full of BEES). 23. The person who carried out this "vicious" assault dressed as a Tetris box, for some reason. So never forget: the police are out there watching all you criminals.